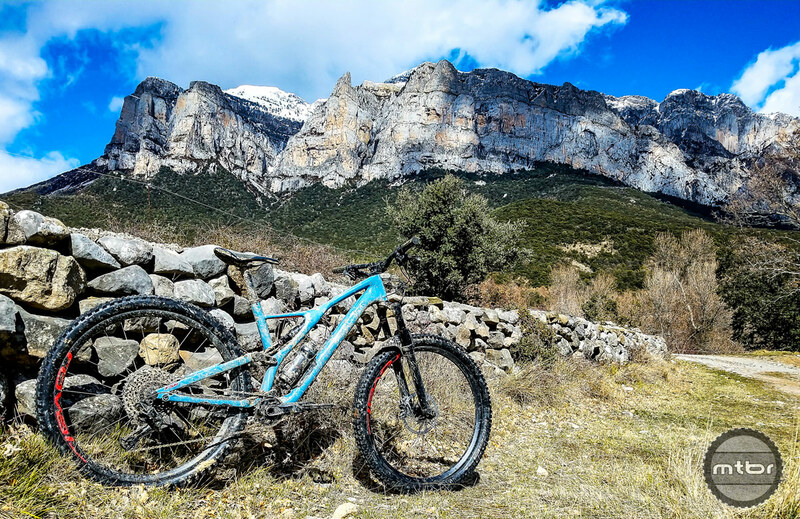 Specialized decided a 17th century Monastery in the Pyrenees Mountains was a fitting location to release their redesigned 2019 Stumpjumper. 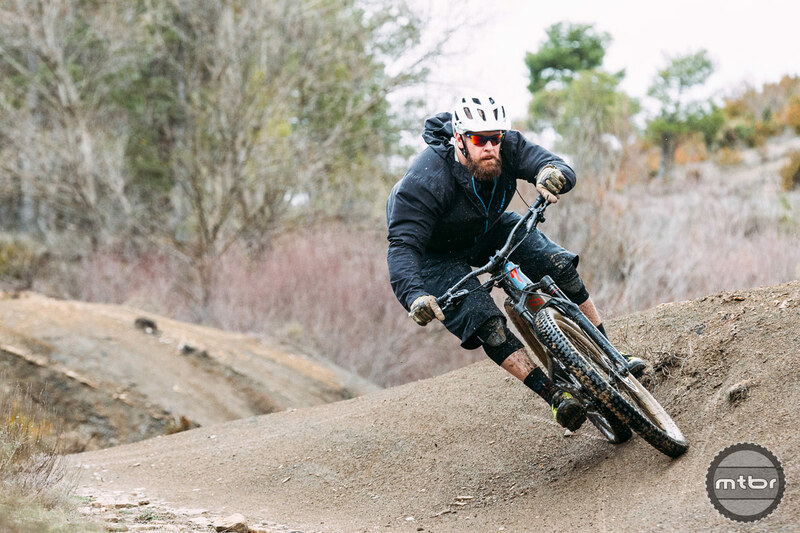 And Mtbr was there, spending three days shredding the local trails and geeking out with the bike’s designers to learn what all their excitement is all about. 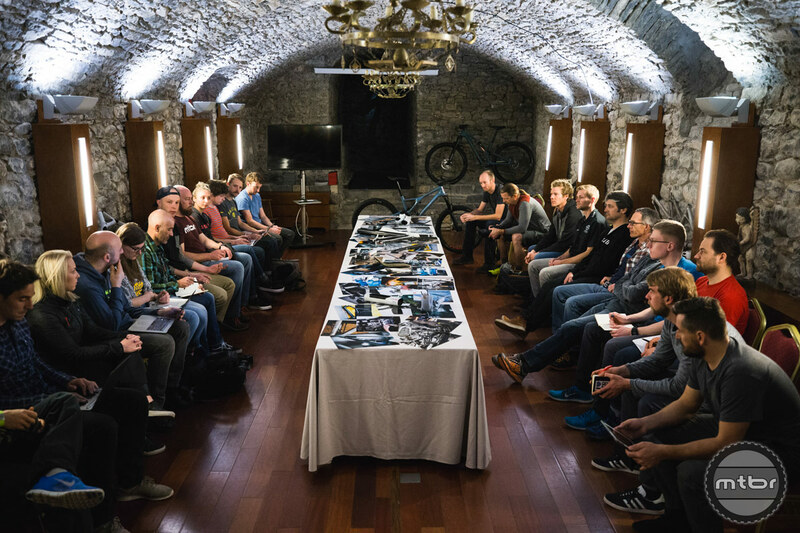 Day 1 was all about what’s and why’s of the new bike, directly from Specialized designers. Development samples were shown to better illustrate the design story and how the decisions came to be. 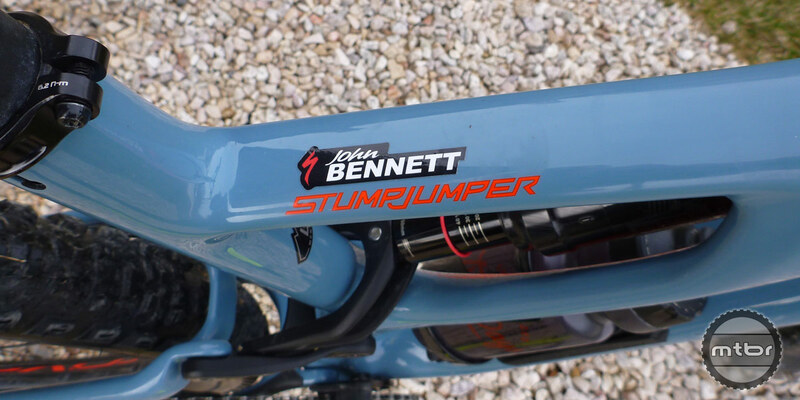 Extensive design and test time went into this new Stumpjumper. Three days of riding followed the technical discussions. 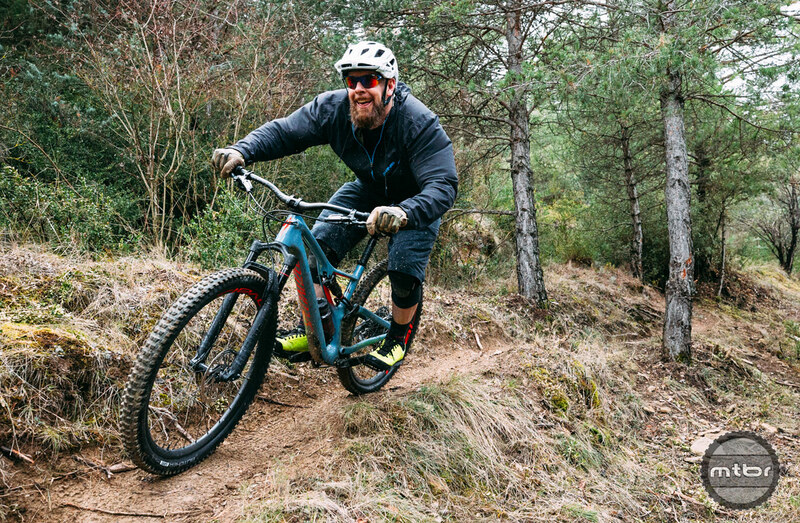 Most of our time was spent aboard a Stumpjumper Expert 29 Standard Travel, size Large, plus additional time aboard the EVO, ST and Alloy versions. Most of this commentary will address the standard travel 29er. If you can’t wait, here’s a quick summation of what we liked and didn’t. The terrain was a combination of flowy singletrack with some fun rock sections intermixed, plus some long fire road ascents, a few technical climbs, and a whole lot of mud. Day one was a quick shakedown ride. The second day was nearly 5000 feet of climbing with snow, rain, and mud (and some time on past Enduro World Series stages). The third day brought shuttles on more EWS stages. 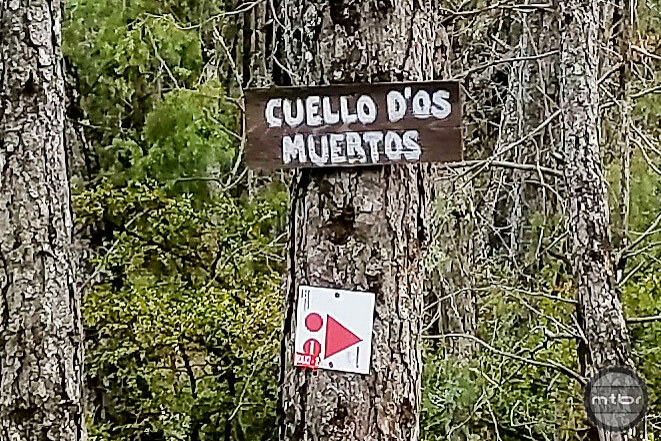 Of course these trails were all unfamiliar, so we’ll provide a more in depth bike review after spending time on familiar trails. The Stumpjumper was pleasant to pedal. The FSR suspension design does account for some pedal bob, yet every shock configured with the bike has the ability to nearly fully lock-out when you want things really firm. That said, I mostly left the damper open or in the middle setting. A SRAM Eagle drivetrain is configured on multiple build levels, so gear range was never an issue. The 170mm cranks are stock on all bikes, aligning with the very low bottom bracket height. Only a few pedal strikes happened, but that wasn’t a surprise on this rocky terrain while getting to know a new bike. The biggest surprise was the frame’s stiffness and lack of lateral deflection. At 6-feet, 215 pounds, typically I can see the frame deflect to the side when weighting the drive-side pedal with cranks parallel to the ground and brake applied. But that flex is virtually gone on this frame. Stiffness was one point Specialized emphasized during the presentations. It was an opportunity for improvement from the previous generation frame, which should improve tracking through high-g chattery corners. Even on steep climbs, I could get power down without the nose becoming too happy or the rear wheel getting hung up on edges. The only occasions I locked out the damper were long fire road grinds, but generally I preferred to let the wheel remain active. A couple of the Specialized designers demonstrated its technical climbing ability up a long line of natural squared edged steps. Nearly everyone else walked this section. I did have a chain explode on me, but it had seen some abuse from a previous tester. Once it and the hanger were replaced, the drivetrain worked without issue even in sloppy conditions. The new Command Post dropper was a nice surprise and much needed. Its 16 positions provide a stop wherever the rider needs and the diameter keeps things stiff. There’s very little flex and lever engagement was smooth. Top-out is firm, but backs off significantly from the smack their previous post delivered. Two nice surprises with the 2019 Stumpjumper are the full carbon frame on all carbon models, plus the carbon wheels on the Expert level build. The Expert build includes Roval Traverse Carbon wheels, while the S-Works includes Traverse SLs. It was also nice to see J-bend spokes, and the hubs were trouble-free, fairly quiet, and had reasonable engagement. The internal width of 30mm is spot-on for 2.5 tires. 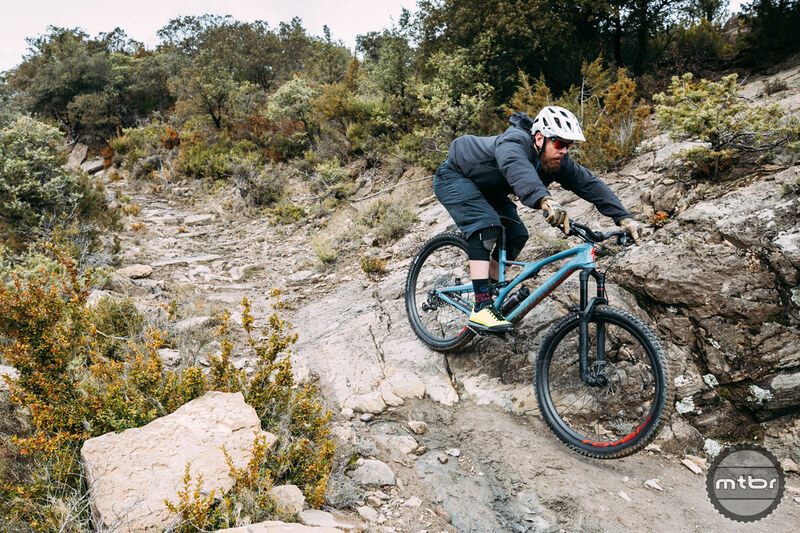 Specialized has changed up the Stumpjumper, making it more capable for the enduro style riding so many people favor these days. The slacker headtube angle, reasonably short chainstays, and fair amount of stack let the rider easily maintain an upright body position when descending. This comes in a relatively light package, creating a do-it-all bike. I’d still look for a 170mm enduro rig for high speed chunky terrain and bike parks, but the Stumpjumper could cover 90% or more of my rides. Another new addition for 2019 is an updated 2.6 Purgatory Grid tire, with the Grid casing now aligning with the 2.6 Butcher and Slaughter Grid casings. On the trail we noticed some squirm even running 28psi, but honestly it was less that what I’ve experienced with other 2.6 tires. The RockShox Pike RC and Deluxe RT3 with Rx Trail tune left me with no complaints, though I’d like more time to fiddle with the setup because much of our riding was on the slippery slide. 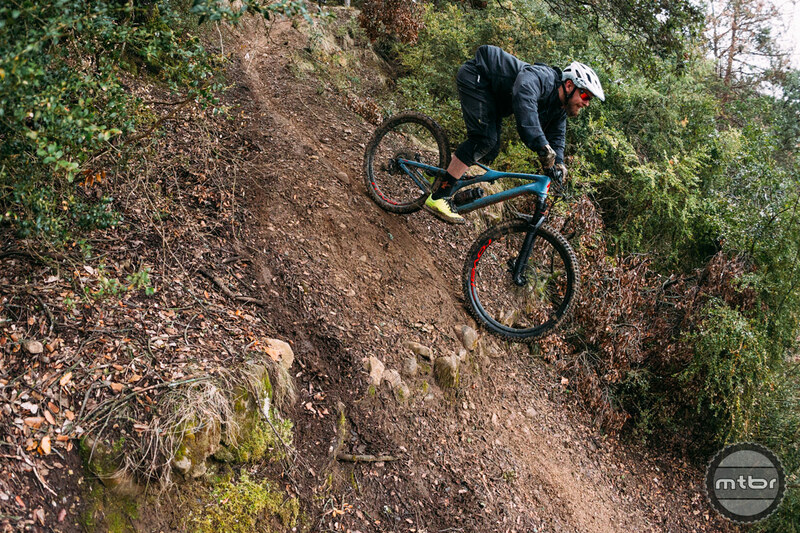 Fox was selected for the S-Works and EVO builds, using a 36 and DPX2 Rx Trail combination. Specialized spent quite a bit of time with both suspension makers, customizing the air springs to match the frame. For the shock, I ended up near 270psi, higher than normal due to the larger negative air spring. Travel utilization was excellent, deep travel had less of an abrupt stop as experienced on the previous generation Stumpy. When the terrain got steep, the 160mm of drop on the new Command Post was quite welcome. After moving from 125mm to 150mm and now beyond, big drop is mandatory. The new Command Post’s performance was solid. There were multiple water crossings on the second day’s ride, around a dozen similar to the photo below. 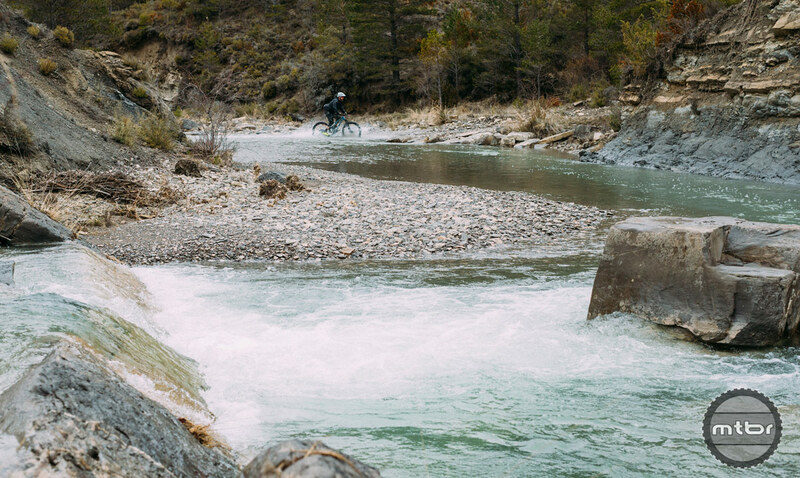 Like most water crossings, they’re a whole lot more fun if you go fast. A pleasant surprise was the SWAT compartment remained relatively dry. The SWAT system can store a save-a-ride kit, tube and pump in the down tube, water bottle on the door, multi-tool either on the bottle cage or for S-Works builds in the steerer tube, the latter with a chain tool and link hidden in there, too. Specialized also revised the cockpits to reflect modern trends. Stems are shorter, and bars are wider with rise. Expert builds use alloy for bars and cranks, whereas S-Works goes full carbon. The only items I’d target for upgrading is an even shorter stem (50mm is stock for large) and the brakes. SRAM Guide R brakes are stock on the Expert bike we used the majority of the time. The Alloy model actually includes some Shimano components, including SLX brakes. After becoming accustomed to the Guide R brakes, I nearly tossed myself when taking the Alloy model for a quick pedal, due to the added Shimano bite. S-Works builds come with Guide RSC brakes, but I’d prefer Codes, which is what the EVO builds come with. 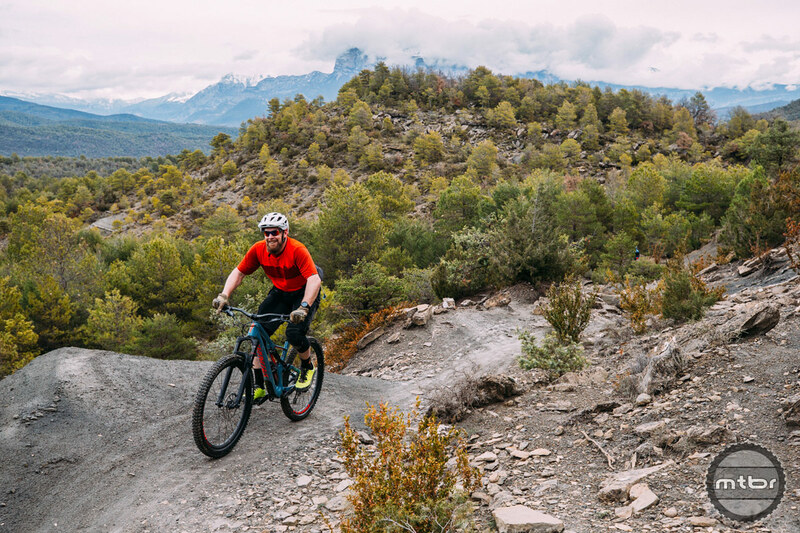 Ainsa, Spain – not a bad place to test bikes. One question I expect many readers will have is, which bike is more appropriate for them, standard or short travel? The short travel bike basically feels like you have already settled the standard travel bike into its travel, which you essentially have. It uses the same frame as standard travel, but a shorter shock, different extension and reduced travel fork. So, it starts out feeling like it’s settled, and just has a bit less travel to play with and lower BB. So rocky technical pedaling could get interesting. However, it absolutely screams. If someone decides to go with the standard travel bike, converting to short travel would require three items: reducing fork travel (changing the air shaft for the Fox 36 or RockShox Pike), a new rear shock and shock extension. The EVO model has a unique feel. I’ve not ridden a mid-travel 63.5 degree bike previously, especially with this much reach. The nose is really out there. It begs for steeps, preferring its pilot just let go of the brakes and blast through or over whatever comes its way. When leaning this bike over and putting some weight into it, you can feel the rear wheel chasing to keep up with the front. I’d love to feel it smashing into berms. As mentioned earlier, Specialized specs the SRAM Code brakes on the EVO and they are excellent. Transitioning back to the standard travel bike provided some visibility into the differences, especially how the front wheel is more underneath you, making the standard Stumpjumper easier to thread side-to-side through terrain than the EVO. 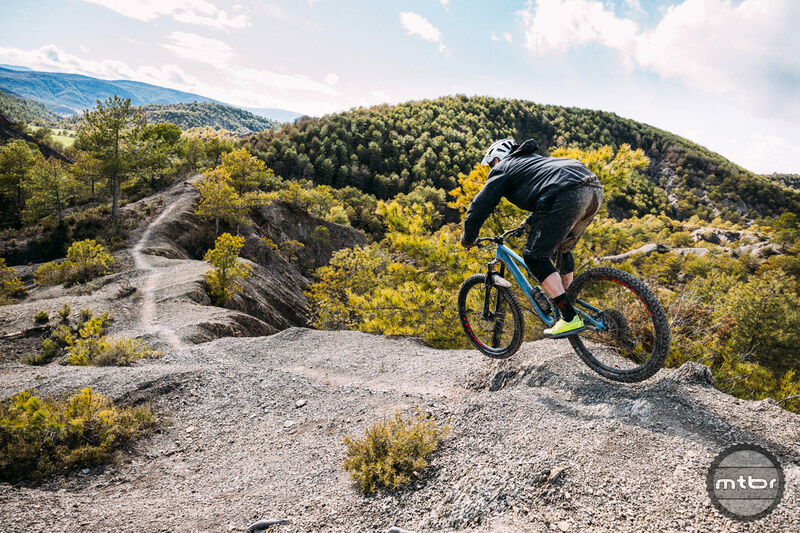 Ainsa is quickly appearing on the dream riding destination list. 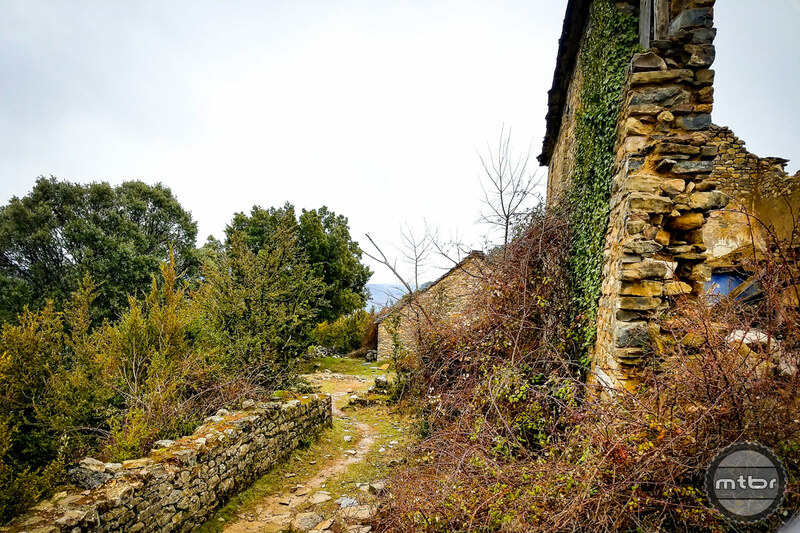 They have an extensive trail system, whose roots are connecting villages, seeing hundreds of years of use, and then they became relatively dormant. 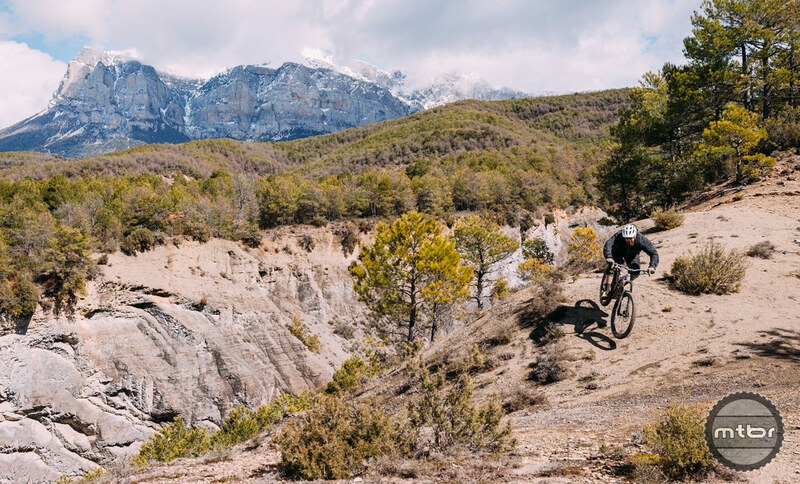 Locals have recently been cleaning them up, and in turn, revitalizing the economy with the popularity of mountain biking. It’s nice to see multiple user groups working together to accomplish this. An app has actually been created so hunters can alert riders and hikers about locations when they are using them to avoid conflict. 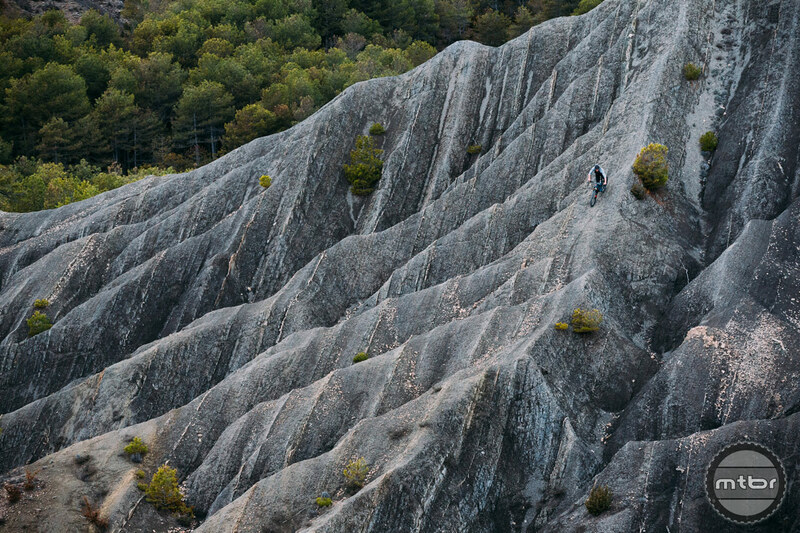 It might sound inconvenient, but there are about 1200 km of trails from which to choose. 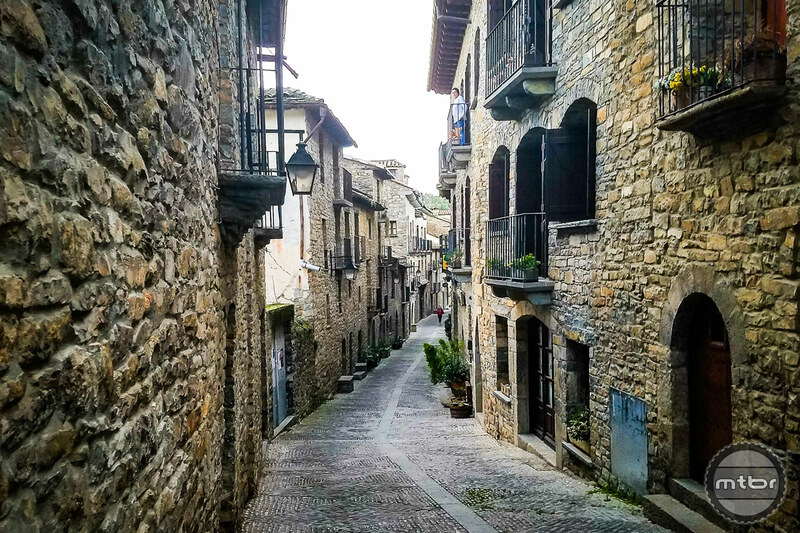 Downtown Ainsa, Spain, city of stone. 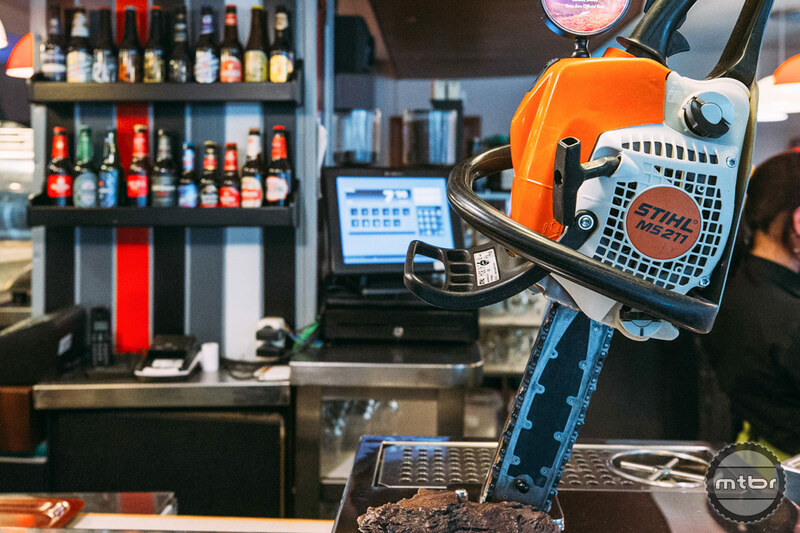 The trail renovation efforts are embraced by local businesses, with Rondadora Brewery making a donation to the local trail organization for every Tronzadora sale. The beer there is next level. 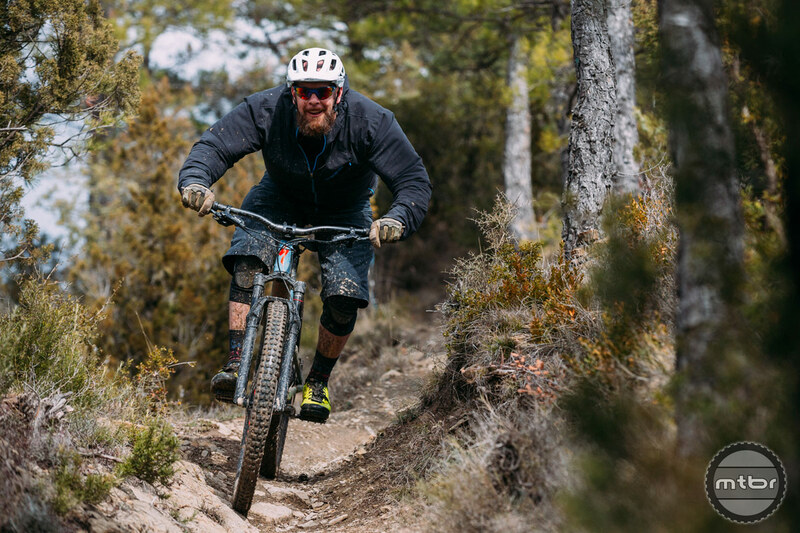 Specialized has taken a very capable trail bike, redesigned it to reflect modern trends while increasing stiffness and reducing weight. They focused on the forces transmitted to the rider, incorporating the spring design with the frame’s kinematics as a single package. Historical consumer complaints were addressed, such as adding a threaded bottom bracket and using a standard eyelet shock. Additional “bonus items” were also included, improving both the SWAT pocket and cable routing. 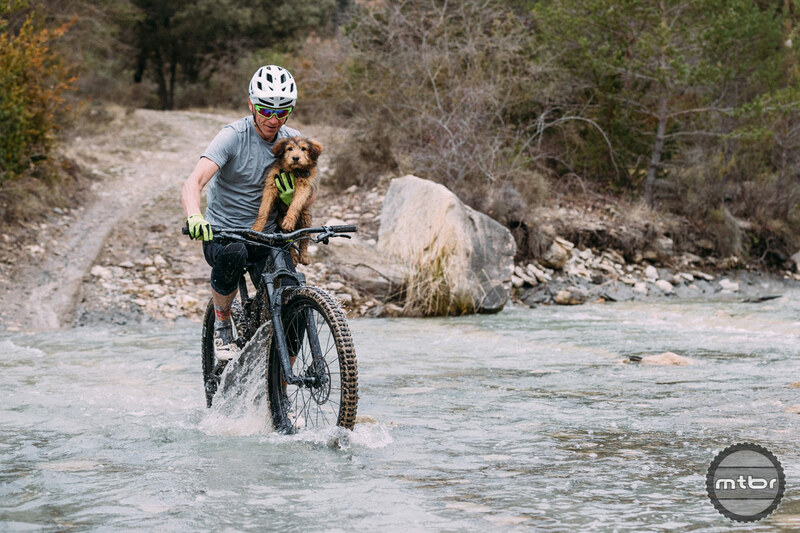 The 2019 Stumpjumper was immediately comfortable to ride, even on unfamiliar and challenging trails. It feels like a no-compromise, do-it-all adventure bike. 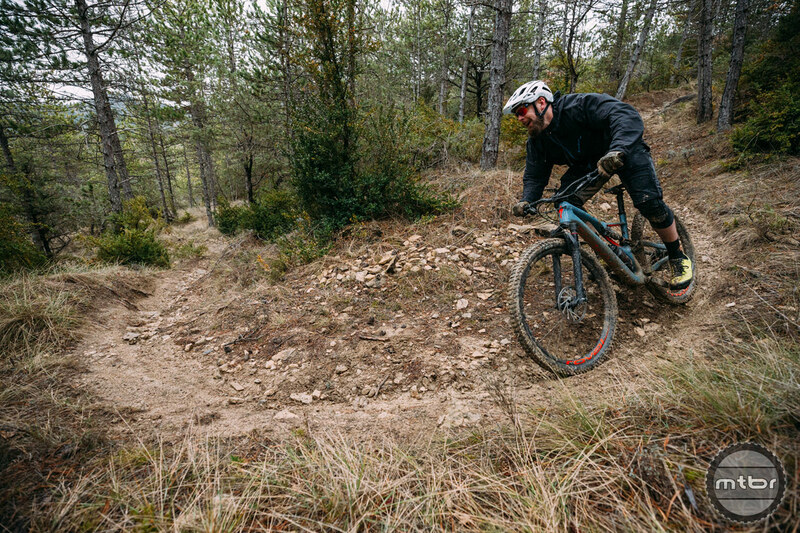 Multiple builds are available, tailored to different riding styles and price points. Ainsa, Spain. Definitely a departure from the norm. 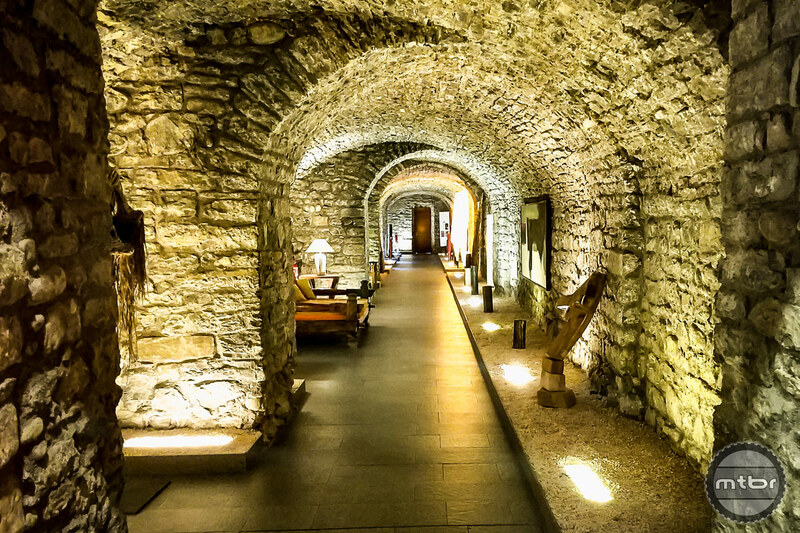 Barceló Monasterio de Boltaña, Ainsa, Spain. Day one in Ainsa, this is definitely not Kansas! Find the bike with your name on it. Check. 2019 Stumper Expert 29, Standard Travel. EWS Race stage, just head past the chapel. Alrighty! That’s the easy way down, right?!? Downtown Ainsa, Spain. City of Stone. I’d argue it’s the rim width. Seems the industry is more or less settling on 30mm as the gold standard. Try 34 or 35mm and you’ll find the tires don’t squirm at lower psi than that (I’m the same weight as the tester btw). So…. Santa Cruz Hightower LT v Expert Stumpjumper?? any thoughts? ?